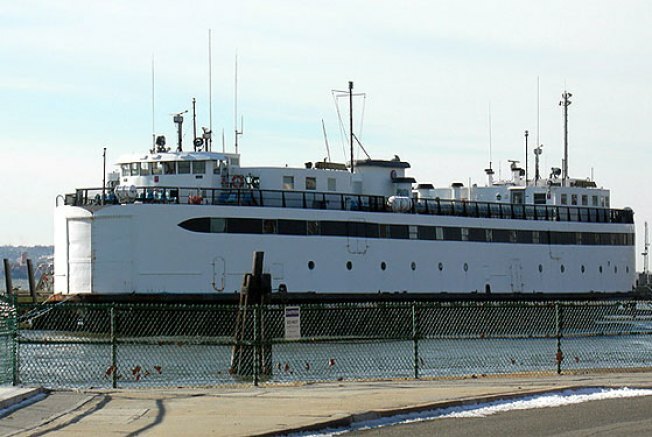 In 2007, the city doled out $500,000 for an old ferry it hoped to use as a shuttle between Manhattan and Governors Island -- 250,000 less than the Martha's Vineyard and Woods Hole Steamship Authority was asking for. Score! But later, when city officials actually plopped it in the water, they realized the damn thing wasn't seaworthy, and it would take $6 million to repair. Uh, well, thanks a lot for that, Massachusetts. You think because you're so cool up there, with your health care and your gay marriage and your decriminalized pot, that you can just con states with no money into buying bad ferries? Jerks. But the city has a plan to recoup all those taxpayer dollars. It's put the ferry up on eBay, where an astonishing 34 bids have pushed the price to ... $14,800. Okay, so we're not going to get that money back. At the very least, though, it'll be amusing to see how the auction's winner figures out how to pick up the 200-foot steel ship they just bought. But if any of those bids are from the Martha's Vineyard and Woods Hole Steamship Authority, we're going to be so pissed. What Do the Knicks’ Trades Mean for 2010? Is Wal-Mart Coming to Union Square?